Happy Holiday and long weekend to all, it's been more than 6 months since I last posted the Magic formula screen for Singapore stocks. Let's take a look at the results if you were to invest in the list of stocks back then and the returns from these counters now. A slight change to the previous list was I have added SPH to the list. 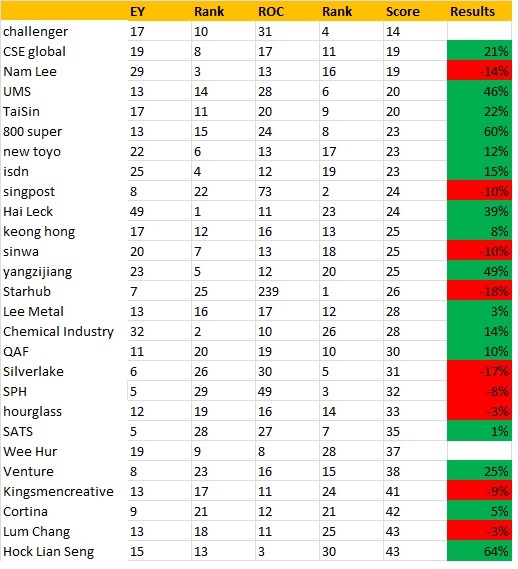 On the last column, it shows the percentage returns of each of the counter, Green indicates that it is a gain and Red means it is a loss. We are already halfway mark into the year, how does your portfolio perform. What do you think of the results shown? Disclaimer: These list of counters not recommendation for buy or sell, purely for analysis purpose.